← Lake Norman Green Homes: Green Holiday Resources! It’s Time to ‘Green Up’ your Lake Norman Landscaping! 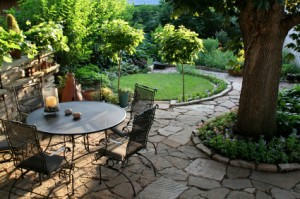 It’s time to “Green Up” the landscaping at your home. How do you achieve lush, green grass organically without spending a lot of “green”? Myth: Organic lawns are not as green as synthetically, chemically maintained yards. Fact: A lawn that is maintained properly using natural fertilizer and organic pest control is not only safer for the environment, but will likely have a deeper green color, better drought tolerance and will be more pest resistant (weeds are pests, too). Myth: Organic lawns are expensive to maintain. Fact: Any lawn that has been neglected is relatively expensive to rejuvenate (organically OR synthetically), and once an organically maintained lawn is healthy, with proper pH levels, appropriate amounts of Macro and Micro nutrients and microbial activity, it will actually SAVE you money on fertilizers, pest control and water. You’ve Gone Green…How do you convince your Yard to Get Green without chemicals? It’s almost too late to apply a winter fertilizer to your cool season grass (like Tall Fescue), but if you haven’t yet, you should do so as soon as possible. Use a lime to raise your pH level. Instead of Dolomitic Lime, if you have a good amount of magnesium in your soil, you may need to use calcitic lime, like Solu-cal or Verde-cal. Loosen your compacted clay soil with Gypsum and top dress with organic matter. While the ground is wet after a rain, look around to see if you have water standing or washing. Repair right away to prevent loosing healthy organic material on the top layer of your lawn and to keep lawns and landscaping healthy and pest free. There are many variables in creating a healthy, pest resistant landscaping, but the first thing you must do is analyze the soil and the health of the plants growing in it. Too much fertilizer or other amendments could be just as bad (or worse) than not enough. Find out what you have first before starting any new program so that you don’t waste valuable money, time, or inadvertently contaminate our water and environment. This entry was posted in Building a Green Home, Green in Lake Norman, Green Landscaping, Green Resources and tagged Lake Norman Green Homes, lake norman green landscaping. Bookmark the permalink.